With the valuable assistance of a skilled team of professionals, we are offering an extensive range of high quality SS Long Bends. We offer these long bends in unmatched designs and shapes at market leading prices. - Used to be installed in balconies to ensure proper safety. We offer Stainless Steel Spigots to our clients. 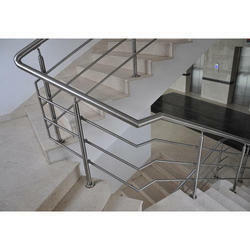 We have firmly positioned ourselves as leading manufacturer and supplier of Steel Staircase Railing. Our available products by us are highly renowned for their durability and other related excellent features. In order to fulfill the demands of our valued clients, these are also available in customized forms.